The UK Syrian community unequivocally condemns US President Trump’s recently announced executive order which places a ban on individuals from seven majority Muslim countries—including Syria—from travelling to the United States in what has been termed his Muslim ban. This ban also puts an indefinite halt to the US’s Syrian refugee resettlement programme. This executive order is not only discriminatory, but it also alienates and stigmatises entire sections of the US and world populations at a time when it becomes more and more imperative that communities stand together in solidarity to address global threats including the Syrian refugee crisis and the threat of terrorism. We are also concerned about the repercussions that Trump’s Muslim ban will have against Syrian refugees who fled the Syrian conflict under the worst imaginable conditions – arbitrary arrest, torture, constant bombardment, and relentless siege. This group deserves compassion and assistance from Western countries, not to mention that many have fled from the very terrorism which Trump has vowed to eradicate. We call upon the UK to echo the stand of Canadian Prime Minister Justin Trudeau by welcoming Syrian refugees banned by the US into the UK. Amid this nightmare inflicted upon the Syrian and other communities in the UK and abroad, the British Syrian community is disheartened at the UK Government’s embarrassingly absent response. Although Trump’s executive order clearly clashes with purported British values of inclusion, diversity, and equality, Prime Minister Theresa May has yet to offer a formal condemnation of this discriminatory policy, and furthermore refused to call out Trump’s divisive rhetoric in her joint press conference with him on Friday. We therefore call upon the Government to offer a formal protest against Trump’s Muslim ban and to denounce it as discriminatory and counterproductive to the fight against terror. We furthermore endorse the petition asking the UK Government to rescind the official invitation for Trump to visit Her Majesty the Queen until his administration lifts this discriminatory policy. 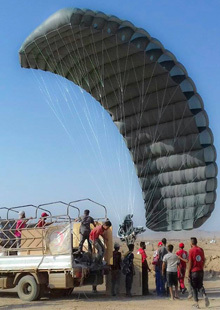 These GPS guided parachutes can fly 25km to a precise landing point. UK refuses to use JPADS airdrops system to aid civilians under attack from Hezbollah and Assad. The World Food Programme’s representative for Syria, Jakob Kern, has confirmed that the agency has used FireFly JPADS for aid airdrops to Deir Ezzor. Around 25 JPADS parachutes have been used to drop mostly medical aid to the regime held town which is besieged by ISIS. JPADS airdrops form just part of the WFP effort: overall the World Food Programme has made 177 air drops in nine months to Deir Ezzor. The World Food Programme has never made a single aid drop to any territory besieged by the Assad regime or its Iranian-backed ally Hezbollah. The vast majority of besieged areas are under siege from the regime. 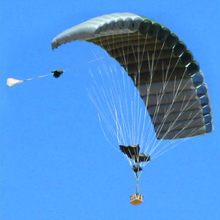 The particular advantage with JPADS is that the system uses GPS navigation to remotely guide the parachute to a precise landing point. The drop can be made by planes at a standoff distance 25 kilometres away from the impact point, and at an altitude of 24,500 feet above sea level, high enough to be safe from MANPADS surface to air missiles. This means that JPADS could be used to drop aid to areas besieged by Hezbollah by planes flying outside Syrian airspace. Last year, NGOs pressed for JPADS to be used to drop aid to besieged civilians in Aleppo City. The proposal was for aid to be dropped from RAF or NATO planes flying beyond regime controlled territory; the JPADS parachutes would then have flown under remote GPS guidance the final 25 kilometres to three designated landing points in Aleppo city. 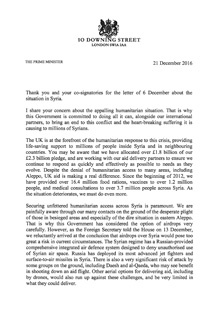 In a December letter to NGOs, Prime Minister Theresa May contrived to ignore this fully viable safe option for helping civilians and for countering Hezbollah and Assad’s forced removal of populations. The UK’s failure to deploy this available technology for the relief of besieged civilians helped speed their forced displacement from Aleppo city. Assad and Hezbollah are now doing the same again in areas between Damascus and the Lebanon border, forcing out Sunni majority populations in order to replace them with people supportive of Hezbollah, Assad, and Iran. Western inaction on this is worsening the refugee crisis, and contributing to the entrenchment of Hezbollah—a proscribed terrorist organisation—across a wide portion of Syrian territory. Theresa May’s refusal to act makes the UK complicit in Hezbollah’s campaign of ethnic cleansing in Syria. Earlier: GPS guided parachutes are being used for arms drops in Syria – but the UK refuses to use them for aid drops. Report for Friday 13th January 2017: Regime signs ceasefire agreement and sends maintenance teams, and then resumes attacks, targeting the maintenance teams. At 11 o’clock this morning the bombardment of Wadi Barada stopped. A ceasefire agreement had been reached allowing maintenance teams to enter Wadi Barada and displaced people to return their villages. The people of Wadi Barada are determined to stay in their area and NOT to sign an agreement with the regime that would forcibly displace them from their homes and villages on green buses, as happened in various towns around Damascus. However, the ceasefire agreement was broken only a few hours after it was signed. 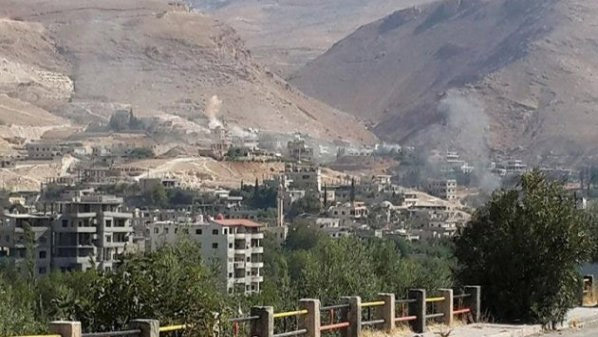 While the regime was negotiating the ceasefire, its forces stormed Wadi Barada. The opposition had announced that a ceasefire in Wadi Barada was a precondition for its participation in peace talks in Astana. Wadi Barada is now facing an unknown fate and we ask that the opposition to announce the failure of the political process in response to the regime’s continued attacks in violation of the ceasefire. All talk of Russian pressure on the regime to stop the attack on Wadi Barada is false. The following YouTube video shows the entry of maintenance teams to the area. However, the video also showed that tank shells landed on the village of Ain El-Fijeh, where the maintenance teams had arrived to repair the Ain El-Fijeh Spring, despite the signing of the ceasefire agreement. In an interview, activist Abdel Qader Fahd said that regime forces directly targeted the maintenance teams, which the regime itself had sent, and bombed the villages of Ain El-Fijeh and Basimah and other areas of the Wadi Barada Valley. Fahd added that this was the second time the ceasefire was cancelled. The previous day, the team that the regime had sent to negotiate a ceasefire with rebels in Wadi Barada was also bombed by the regime side. Several militias are fighting alongside the regime, including the Lebanese Hezbollah militia. Fahd also said that regime forces had advanced in their assault on the village of Basimah. A video uploaded later by Abdel Qader Fahd to YouTube shows the maintenance teams repairing the Ain El-Fijeh water plant while gunfire was heard in the background. In the video, Fahd says that the maintenance teams had resumed their attempts to repair the plant at 8pm despite the ongoing attack on Basimah and that the ceasefire agreement had been a trick to allow the regime to launch a surprise attack on Basimah. The maintenance teams have been directly attacked by the regime and one of their vehicles had broken down because of the gunfire it had sustained. The maintenance teams’ work is aimed at restoring the water supply to Damascus. Report for Thursday 12 January 2016. Warplanes and helicopters haven’t stopped bombing the villages of Wadi Barada since last night with barrel bombs and missiles. 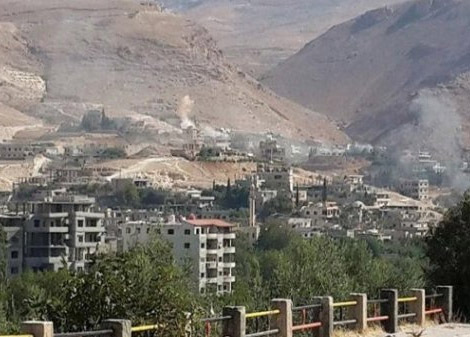 For the 21st day running the regime, Hezbollah and other militias allied with them have continued with their criminal assault on Wadi Barada, despite a ceasefire. Since the early hours of the morning regime forces have targeted the villages of the area with heavy artillery, tanks, warplanes, helicopters, and rockets. They have tried to storm the area from the Kfeir Al-Zeit entrance. Civilian homes have been bombed with IRAM and GRAD rockets and targeted by snipers and heavy machine-gun fire. However rebels have resisted their advance and prevented them from making any gains. The regime used chlorine gas in Basimah, resulting in the injury of two people. A 12 year old girl died and three other people were wounded in the village of Dair Qanoun as a result of the regime’s attacks. One person was killed in Kfeir Al-Zeit as a result of intense sniper fire. Russian helicopters dropped bombs on the village of Basimah in Wadi Barada on Thursday alongside regime helicopters. Regime helicopters carried out 30 airstrikes on Basimah and the outskirts of Ain Al-Fijeh village. In what appears to be a new strategy, the regime is using two helicopters in every airstrikes. Each one drops four barrel bombs. Three days ago Russian helicopters started accompanying regime helicopters. Each helicopter drops six bombs at the same time and their bombs are bigger than the regime’s barrel bombs. The regime’s warplanes bombed Ain al-Fijeh village on Thursday. Some of the strikes were directed at the Ain al-Fijeh Spring and the surrounding area as well as local houses. Some houses were completely destroyed. The regime’s warplanes started bombing Ain al-Fijeh at six in the morning. At the same time the village was subjected to intense bombardment with artillery, tanks, and Gvodzika howitzers, as well as heavy mortars which fell on residential areas and farms in the village. It’s important to note here that the regime’s “Military Media” network today broadcast for the first time scenes that it said were from the Ain El-Fijeh spring, the surrounding area, and the village of Basimah. This comes 23 days after the beginning of the military assault on Wadi Barada, which has continued despite a proclaimed “ceasefire”. At the beginning of the assault the regime blamed those it called “terrorists” for blowing up the Ain El-Fijeh water plant and pollution of its water. However, the regime’s lies were exposed by videos broadcast by the Wadi Barada Media Centre, showing the regime’s rockets and barrel bombs falling on the Ain El-Fijeh, causing damage to the water plant which caused it to become completely inoperational. As a result, it has stopped supplying water to Damascus and the villages of Wadi Barada. Video: Regime raids on Basimah village. By Wadi Barada Media Centre. Report for Tuesday 10th January 2017. Omar Qantaqji, a young man resident in Ain El-Fijeh was killed today and seven other people were injured a result of an intensification of bombardment by regime forces, the Lebanese Hezbollah militia, and the Qalamoun Shield brigade on the villages of Wadi Barada. From the early hours of the morning regime forces tried to advance from the entrance to the village of Basimah. Heavy artillery, tanks, IRAM surface-to-surface missiles, and heavy machine guns and sniper fire were all used. The rebels resisted their advance and there were violent clashes. The rebels managed to burn two tanks and damage a “Shilka” mobile anti-aircraft gun. After this the regime carried out more than 15 raids on the village with planes, helicopters and IRAM surface-to-surface missiles, as well as B10 heavy machine guns. Regime forces also bombed Ain el-Fijeh village with heavy mortars, shells, and snipers also targeted the village. Like on every day, The Ain El-Fijeh Spring water plant was bombarded with shells and rockets, increasing the damage and destruction it has already suffered. Civilian houses were also damaged. Rebel snipers killed two regime troops who tried to advance on the Hawat Mountain overlooking Ain El-Fijeh. There were also clashes between regime forces, Hezbollah, and Qalamoun Shield militia on one hand and rebels on the other around the villages of Kfeir Al-Zeit and Al-Husseiniya after an attempt by the invading forces to advance deep into these villages. However, the invaders were unsuccessful in making any significant advances after the rebels stopped them. On a humanitarian level, the villages of the area have had no water, electricity, mobile or landline telephone service or Internet services for 20 days following the regime’s bombardment of infrastructure and vital facilities. Diseases are spreading after homes and mosques in relatively safe villages have become overcrowded with people and the medical authority in Wadi Barada says that the reason for this is that people have drunk unpotable water which has not been purified and have become in close proximity together as a result of the regime’s attack on the area. Video: Regime forces and militias in the surrounding mountains of Wadi Barada. The following report comes from Wadi Barada, an area between Damascus and the Lebanese border under siege by Hezbollah and Assad regime forces. Wadi Barada is the source of the main Damascus water supply. On 23 December, as part of the attack on the area, the Assad regime bombed the Fijeh Springs, interrupting the water supply. See Bellingcat’s report here. Hezbollah have a strategic interest in seizing Wadi Barada and other besieged areas between Damascus and the Lebanese border in order to secure supply their supply routes. 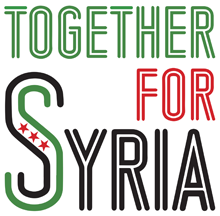 See the APPG Friends of Syria report here. The Hezbollah military is a terrorist organisation proscribed by the UK since 2008. It is supported by Iran and is allied with the Assad regime. Despite its status as a proscribed terrorist organisation and its role in besieging civilian populations in Syria, Hezbollah is not currently targeted by the UK’s counterterrorism action in Syria. Report from Sunday 8th January 2017, the 19th day of airstrikes on Wadi Barada. Warplanes have continued their airstrikes on the villages of Wadi Barada for the 19th day running. These airstrikes have increased in intensity simultaneously with the escalating ground attack on several fronts around the area. Since Sunday morning, warplanes have carried out intense bombing on the village of Ain El-Fijeh, and this was followed by clashes at the villages north-eastern entranceas regime forces tried once again to storm the village. Simultaneously, heavy artillery and rocket bombardment hit most of the residential areas and farms of Ain El-Fijeh. The warplanes carried out 20 airstrikes on Ain El-Fijeh until the afternoon today. During this time and afterwards the regime continued to bomb the village with artillery, rockets, heavy machine-gun fire and sniper fire. This is ongoing. This has all led to widespread destruction as the warplanes have targeted buildings with rockets which cause heavy damage. The warplanes also renewed their airstrikes on the village of Basimah around noon and bombed the village with artillery and IRAM rockets, also targeting it with heavy machine gun fire and artillery. This was followed by an attempt by regime forces to advance from the direction of the Basimah Valley intersection. Rebels managed to stop their advance. Regime forces and militia have made dozens of failed attempts to advance on Wadi Barada during their 19 day assault on the area. In the past hour, approaching midnight, the regime has continued to bomb Basimah with 20 IRAM rockets as well as missile batteries, mortars, and tanks. Clashes between revolutionaries and the regime’s Qalamoun Shield militia have renewed on the outskirts of the village of Kfeir Al-Zeit, at the Tallat Nahlah intersection, after regime militia tried to advance under the cover of heavy bombardment. Rebels managed to stop their advance and there have been reports that regime militia members have been killed and injured. The frontlines between the two sides remain unchanged. The Lebanese Hezbollah militia resumed their attack southwest of the village of Al-Husseiniya, trying once again to storm it, under the cover of rockets and artillery. They did not manage to advance but the bombing led to the death of a young man as well as the destruction of houses in the villages. 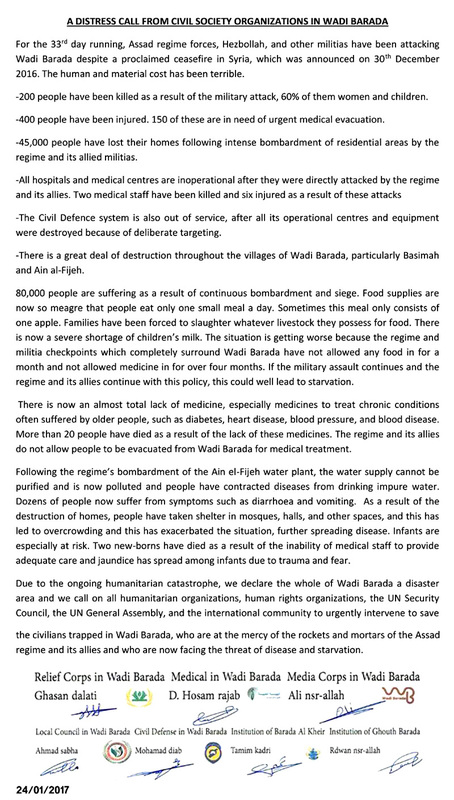 Turning to the humanitarian situation, the regime’s bombardment and siege of Wadi Barada has led to the cutting off of all sources of food, medicine, and fuel to 100,000 civilians and the breakdown of essential services including electricity, water, communications, and the Internet. The regime has used its cutting off of communications and the Internet to Wadi Barada to isolate it from the media and spread rumours and lies about negotiations, blaming those it calls “militants” for the explosion at the Ain El-Fijeh Spring and cutting off water to Damascus and claiming that they have prevented repair teams and equipment from entering the area. 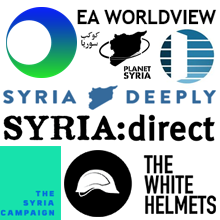 These regime claims have backfired because video evidence and previous reports by the media authority have shown the regime’s direct targeting with rockets and barrel bombs of the Ain El-Fijeh spring. 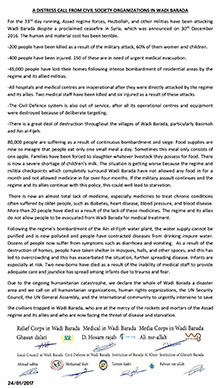 The regime has also stopped any negotiations and efforts to solve the water problem and it is completely responsible for what happened. It is also responsible for any potential disaster caused by its military assault on Wadi Barada. First screened in 2015, Syria’s Rebellious Women is a series of short documentaries by Zaina Erhaim. Read a review of the series by Clara Connolly. Zaina is now putting some of the short films online. Zaina writes: Ahed is one of the women documented in the Syria Rebellious Women series. She left Aleppo, still you’ll always find her protesting, working for Syrians wherever she goes. Zein Al sham was forced to evacuate her sieged city Aleppo at the end of last year. She was one of the last to leave. Ghalia Rahal, Khaled's mother, is one of the women documented in the Syria Rebellious Women series. She lost Khaled after filming this, but still running all the Mazaya centers in Idlib suburb.